My first visit to the Garden at Federal Twist was just about a year ago, in October 2013. I've been back since then, this summer for example. So when I was thinking of places to take Betsey, my October WWOOFer, of course this was one of the first places that came to mind. 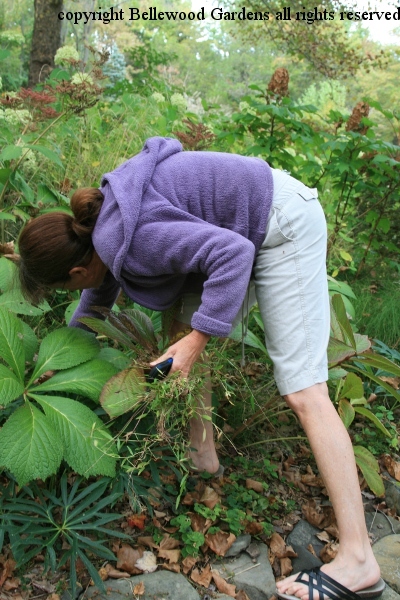 Native plants that thrive with the conditions of soil and moisture natural to the site. Definitely sustainable. By the calendar it is autumn. Plants still have some of summer's greenery. 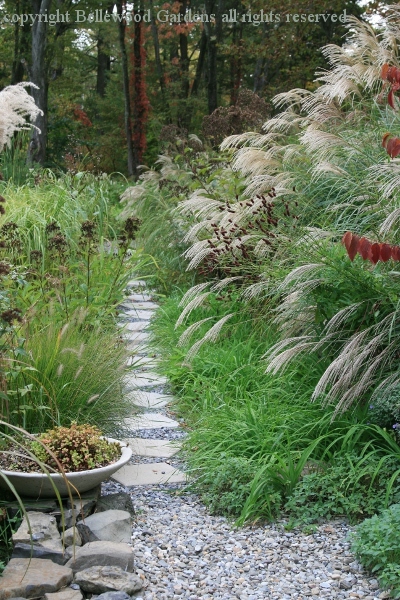 Ornamental grasses have their plume-like seed heads, capturing light and nodding over a narrow path. 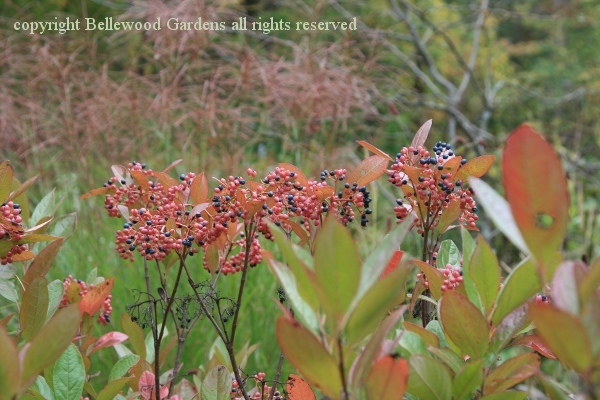 Viburnum 'Winterthur' caught in transition, red berries ripening to dark blue. 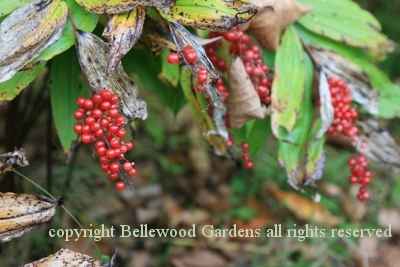 Perennials are also heavily in fruit. Here, one of our charming native woodland plants, Smilacina racemosa, false Solomon's seal, so heavily in berry that the stems nod over towards the ground. Betsey has been busily weeding at BelleWood Gardens, tackling the endless quantities of invasive Japanese stilt grass, Microstegium vimineum. So it was only natural for her to go after some she noticed here. 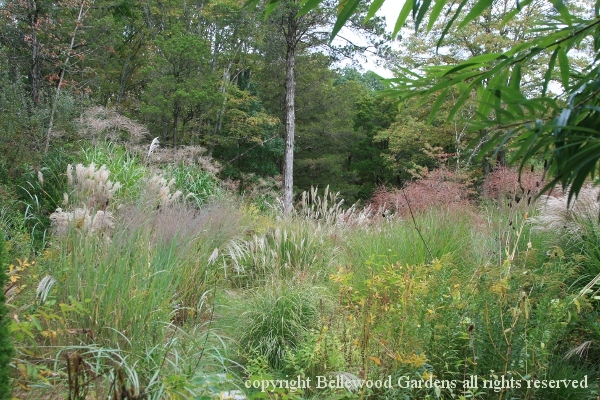 A few perennials lend late flowers to embellish the landscape. 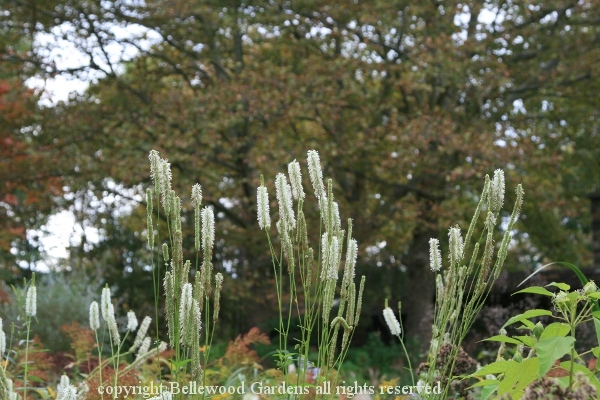 Sanguisorba canadensis, Canadian burnet, fires up its white candle-like wands of flowers to light up the landscape. 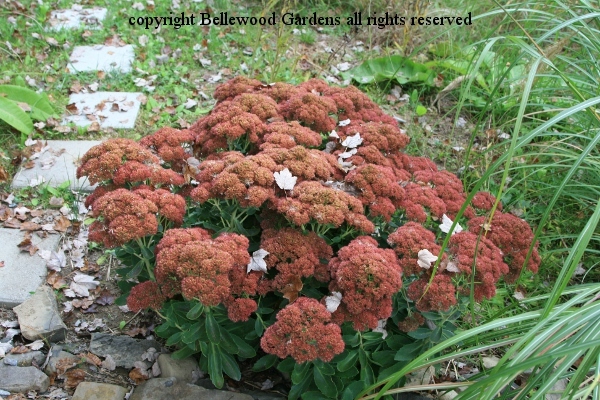 And the stout deep rose pink broccoli-like flowers of Sedum spectabile catch falling leaves, one by one. But what's this? 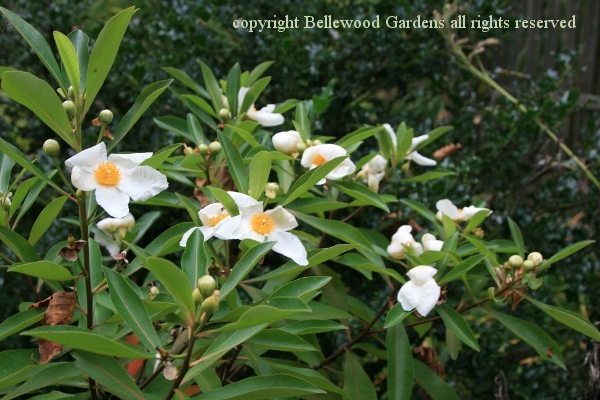 Not Franklinia, as I first thought. Enthusiastically (and with good reason) James tells me that this is xGordlinia grandiflora. Grand flowers indeed. 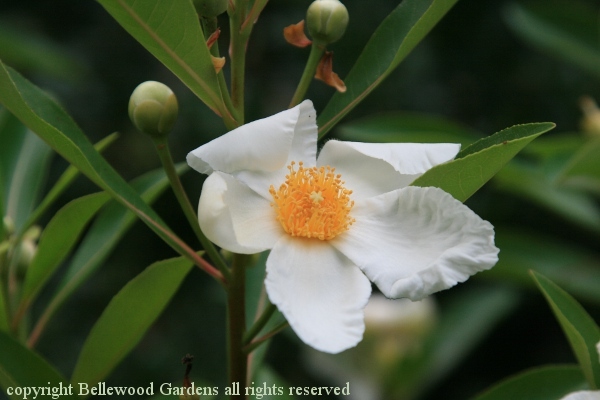 It is an interspecific cross between Franklinia, a native species found once by John Bartram in the southeastern United States and then never seen in the wild again, and Gordonia, a species native to Southeast Asia. What a beautiful flower at any time, especially so as the year winds down in autumn. Color in the garden. A stately Calderesque mobile twists in the little wind. 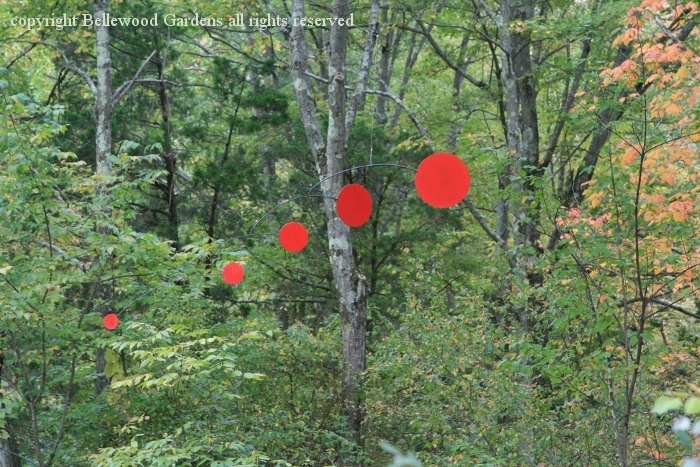 Scarlet is the color of choice to accent the Garden at Federal Twist. Red daylilies. 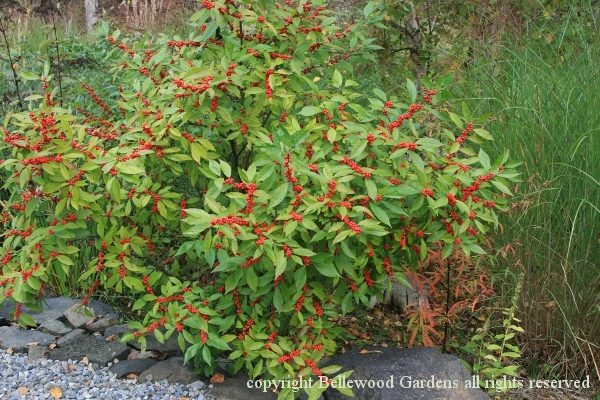 Red berries. Red art work. UPDATE: Saturday, 22 November 2014. 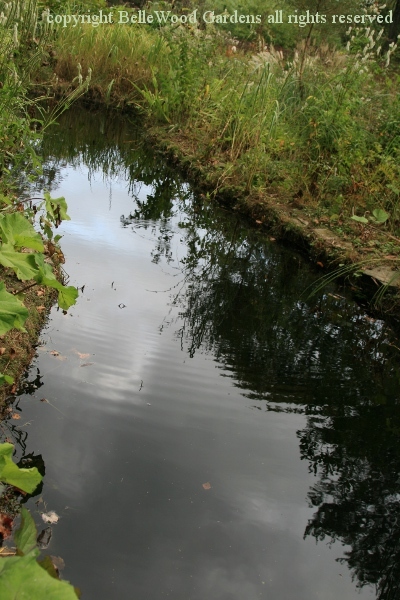 As we were strolling around the garden last month James mentioned that he had thought of building a bridge across the long pond, near the middle. Ever one to offer suggestions I protested that that would visually chop it in half. 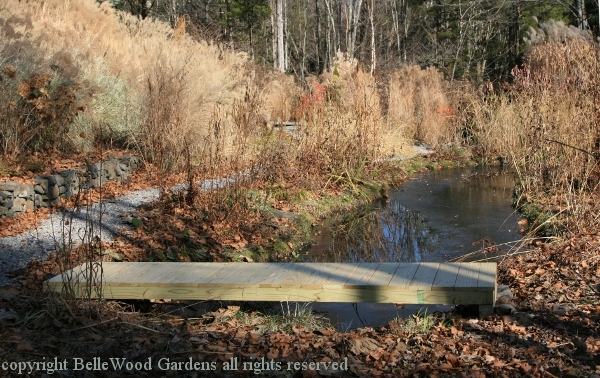 Better, I thought, to make a narrow bridge / deck / dock - whatever you care to name it - across one end. This idea really appealed to him, I could tell. I wondered if as soon as Betsey and I departed James would be off to a lumber yard. Now the question is what color to stain it. Oh well, that can probably wait until Spring.